The incident took place in the early hours in Sector 19 where the car, registration number HR 26 BH0562, was vandalised. 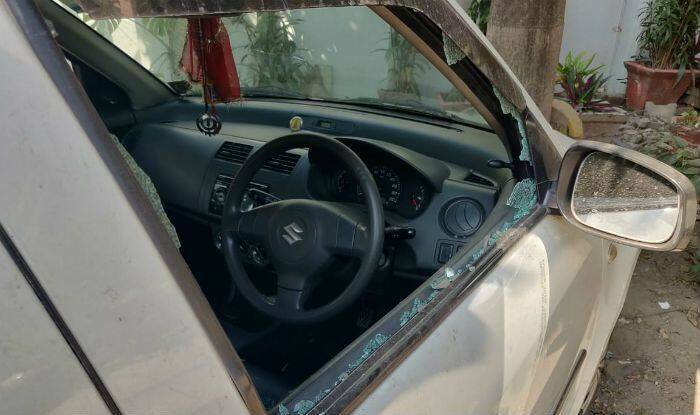 Noida: A journalist has alleged that his parked car was attacked by unknown miscreants in Uttar Pradesh’s Noida on Wednesday morning. In an apparent bid to steal the car, thieves also smashed the window of the Swift and stole its battery. The incident took place in the early hours in Sector 19 where the car, registration number HR 26 BH0562, was vandalised. Damage also included a shattered bonnet. They even tried to break the front windshield. The thieves may have tried to tow away the vehicle but failed as the gear lock was in place. A complaint has been filed against unknown persons at the Noida police station. This isn’t the first time that such an incident has been reported. Vandalising cars and stealing of the same has been going on for quite some time in the area. Police have not been able to check the menace. Last year, in November, an SUV belonging to a Supreme Court lawyer was allegedly stolen by four men who forcibly got into the vehicle and overpowered the driver.